Aside from its immense-attention grabbing power, the title of this post also serves as an effective reminder to those skeptics among you (you doubters, ye of little faith!) that when we, (i.e. we over here at Lionandox.com) make promises, we sometimes do deliver on our promises! What responsibilities…Why, the very serious responsibilities that devolve upon those engaged in the daily defense of classical education! It is one of those cruel ironies in life that classical education even needs defending! Surely an education which aims at the perfection of the human being qua human being would seem on the face of it to need no defense. In fact it is precisely every other kind of education that needs defending. How is it defensible that anyone would not seek a classical education? Don’t ask me. Doesn’t our human nature demand it? But this is a discussion for another day. Presently we are engaged in discussing why we read Aeschylus! Now I should point out that I haven’t read the Oresteia as a whole for at least a year, but I did have the good fortune of seeing the third play in the trilogy, to wit The Eumenides, acted on stage by a talented cast of seventh-ninth grade students that happen to attend the prestigious little school where it is my honor to teach. I was reminded that God surely must have inspired Aeschylus with an understanding of man’s fallen state, his life, and his condition, specifically to instruct the world about man. And not only that, Aeschylus makes us feel the right way about these things as should be the aim of any good poet. 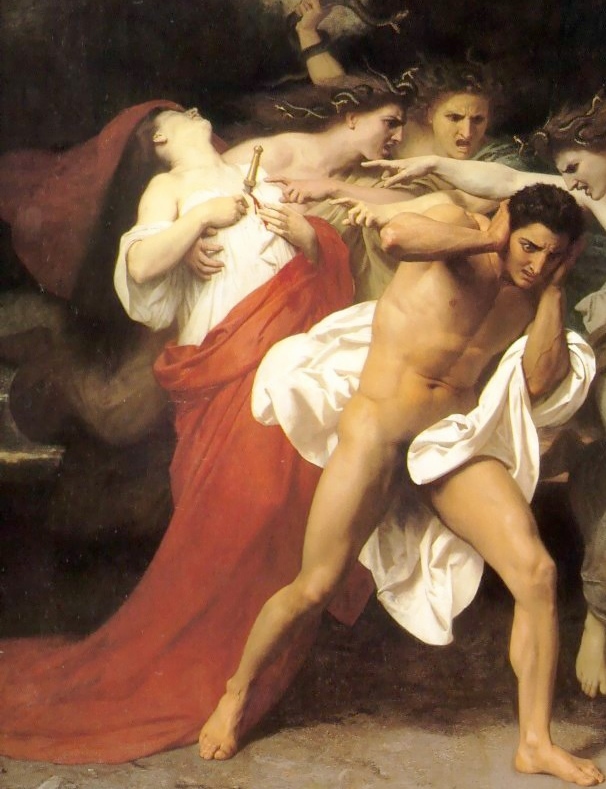 For example where is there a better and more vivid testament about the reality of man’s conscience than that which is portrayed by the Furies in the Eumenides? Where is there a more vivid image, evocative of an unclean conscience, than those frightful terror-inspiring relentless goddesses whose duty it is to hunt down and take vengeance upon those who have not paid for their crimes – and especially upon those who have committed crimes against nature! When stirred up towards the prosecution of sin they are horrid to behold as doth attest the Pythian Priestess! Nor may I match the Gorgons’ shape with theirs! The eye’s abomination to behold. To statues of the gods or homes of men. So powerful is conscience that even were a god to hide him who has committed an unrighteous act, yea, even if he were to hide him in the very depths of hell, he cannot escape his conscience! Descending on his head who foully slew. Aeschylus powerfully teaches us that no crime goes unnoticed by God. Nor does the sinner escape his own conscience but that according to our very nature no crime goes unavenged and every sin must be expiated. Unto the judgment wills he to be brought. The arm of doom can reach! Conscience, just like the Furies, will never let the sinner rest and will ultimately drive him to despair or conversion. I say, then, that the Supreme Being…implanted this Law, which is Himself, in the intelligence of all His rational creatures. The Divine Law, then, is the rule of ethical truth, the standard of right and wrong, a sovereign, irreversible, absolute authority in the presence of men and Angels. 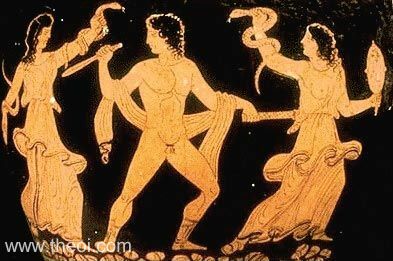 Every sin is a disturbance of the natural order of things-but lest their be any doubt, Aeschylus illustrates the unnaturalness of sin through matricide, which even the most hardened of hearts must certainly recognize as unnatural. This view of conscience…is founded on the doctrine that conscience is the voice of God, whereas it is fashionable on all hands now to consider it in one way or another a creation of man…The rule and measure of duty is not utility, nor expedience, nor the happiness of the greatest number, nor State convenience, nor fitness, order, and the pulchrum. Conscience is not a long-sighted selfishness, nor a desire to be consistent with oneself; but it is a messenger from Him, who, both in nature and in grace, speaks to us behind a veil, and teaches and rules us by His representatives. Conscience is the aboriginal Vicar of Christ, a prophet in its informations, a monarch in its peremptoriness, a priest in its blessings and anathemas, and, even though the eternal priesthood throughout the Church could cease to be, in it the sacerdotal principle would remain and would have a sway. To those who read the literature of the Greeks, to the reader of Aeschylus, Newman’s discourse on the Divine Law, the Natural Law and Conscience will come very naturally. Such reading is propaedeutic to the teaching of the Gospel. Knowing his reverence for Homer, that is high praise indeed! Image | This entry was posted in classical education, education, Newman and tagged aeschylus, Classical Education, conscience, Eumenides, Greek Literature, John Henry Newman. Bookmark the permalink.